Last Wednesday was a very big day in our household. It was Miss M's first school visit! 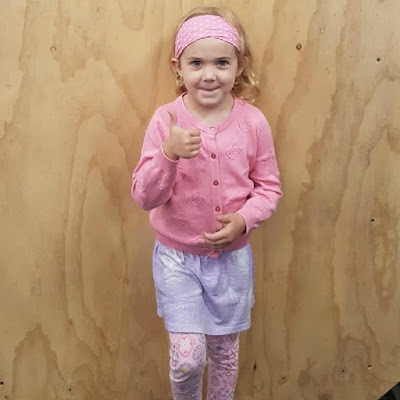 And a bit about her journey and the time spent at our beautiful Child Care centre over the last two years (she is enrolled in the Kindergarten program they have there in case any of you were wondering). If you have only recently started following me - I'd love for you to take a read at a couple of those stories - especially if you are experiencing one of those stages at the moment. And now, it's happening. SCHOOL! She gives her school a big thumbs up! I've been on the other side of this process for 12 years. I've been the teacher busily setting up the classroom and welcoming a group of brand new Receptions. I would be helping them to settle in, comforting the teary ones, and trying to put parent's minds at ease. It is such a big step. I didn't realise how big until now. Until I was on the other side of it. Recently I shared on Instagram that we have been having a bit of an emotional time with Miss M lately. Tears at drop off time (which I endured from when she was 18 months until 3 years), refusing to participate in dancing lessons and not even getting in the pool at swimming. Even HUGE tantrums with socks and shoes?!?! It has been such a hard month. But she seems to be coming out of this phase and is really excited about her next chapter. She's ready for the challenges and opportunities that school will be able to provide for her. So the night before the first school visit she and I chose her special outfit (to minimise morning tantrums), and to our surprise she went off and dressed herself which is so different to normal. I happened to be working that day, so James brought her in to school. She popped passed my classroom to say hello and then the two of them went off to begin the session. Apparently she needed to be peeled off James' leg, but settled quickly. She played, she drew, stayed by the teacher's side and sat right at the very front of the group. When we went to collect her afterwards she was smiling from ear to ear and all feedback from the teachers was very positive. After they left, James took her to Smiggle to pick out her brand new school lunch box! Yesterday was day two. The children have now been split into their classes and so Miss M knows who her teacher will be (a colleague who I think is just brilliant!). She had another really enjoyable session with no tears or hesitation to leave James. She's becoming more familiar with the school environment and is getting really excited! So what's next? Well she's planning to ask Santa for a Smiggle back pack, and we'll have to get her school uniform organised at some stage before it gets too late. We'll keep incorporating letters, words and numbers into our every day life but without forcing too much on her. I've always been one to let her take the lead on her learning. I'm so glad and relieved that the process has gone so well. And I'm so excited for the next part in Miss M's story. Who else has a little one starting school next year? I'd love to hear your stories of the transition process. Miss L had her first transition visit last week and was completely chill about it. I think going to OSHC at the school has helped and it looks like most of the kids from kindy are going to the same school as well so it's pretty familiar to her! It's so exciting to see her ready to take on the next stage - hope she continues to enjoy it.